At Corona Contracts we have been completing projects for over 20 years, supplying and installing commercial and medical blinds, curtains, curtain track systems, window films and customised manifestations in various buildings, homes and institutions across the country. We have carried out successful projects in various parts of the UK including Lancashire, Cumbria, Cheshire, Merseyside, Greater Manchester, Preston and Liverpool. We’ve worked with clients in the hospitality industry, the public sector, private medical and education facilities, event spaces and many more. We have developed industry leading expertise on light control systems for all types of workspace. Our motorised curtain supply and installation service takes us to many different types of building, institution as they provide many benefits. The first and foremost is that of convenience, as lighting can be adjusted at the touch of a button. This is especially useful for large and heavy curtains or those in harder to reach spaces. They are also great for making a lasting impression on visitors and clients. We find that this functionality is much appreciated for presentation areas in offices as well as for meeting the demands of stage and cinema screen curtains. Control can also be automated, you can set your system to open or close at specific times. This can be used to make a building appear occupied even when no-one is present, providing a security advantage all year round. Automated operation can be set to react to ambient light level or to close at specific times to help trap heat within a space and reduce energy bills. To view our range of Mottura motorised curtain track systems, click here. We work closely with clients in order to provide bespoke products perfectly tailored to the environment in which they will be used. We use some of the best products available, such as those produced by Mottura. Their softshade curtain tracks are an excellent choice for reducing glare and solar heat while still maintaining light in the office and their motorised curtain track range features four excellent systems. Curtains weighing up to 150 kg or an overall track length of 30m can be achieved and they also have the flexibility of being able to be operated manually, too. This makes them suitable many kinds of professional use and won’t leave you without any control in the event of a power outage. If your building has specific challenges, perhaps an historical building with unusual window fixtures or a room with extremely high ceilings, this doesn’t mean that our motorised systems are out of the question. The team here are expert designers and problem solvers, so whatever your needs do discuss them with us. We can combine a number of techniques and ideas in order to achieve our client’s dream installation in even the most difficult of spaces. This is the advantage of working with Corona, since we not only design, but also build and install our products. Our ability to create bespoke products as per our clients’ specifications allows us to deliver exactly what is needed in any given situation. We manufacture many of these systems ourselves, giving us complete control over delivery times and costs. We pride ourselves on great customers service and our valued clients always benefit from our complete attention from the beginning of the project to the end. If you are considering a motorised curtain track system, or are ready to get started, contact our team today. What are the benefits of motorised systems? 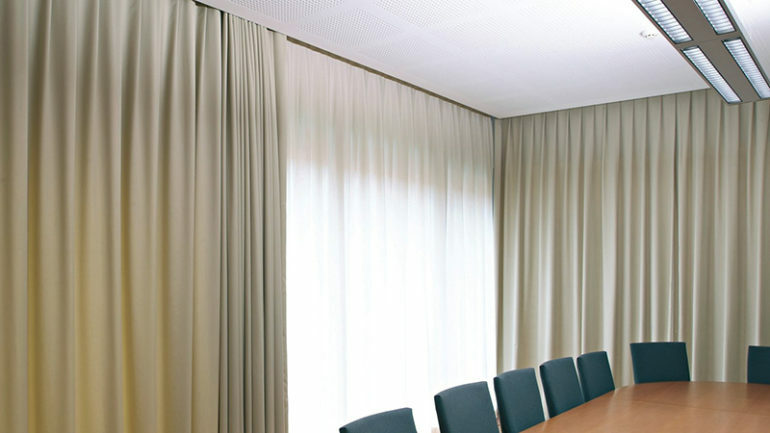 Corona Contracts specialise in motorised curtain track and blinds systems for commercial environments. We have extensive experience in fitting offices, schools, theatres, hospitals and just about any other professional space you can think of. Our motorised curtain track systems are extremely reliable, of the highest quality and can be customised to the exact specification of your business. If you’re currently considering an upgrade to the curtain fixtures and mechanisms in your work space, it’s certainly worth considering motorised systems, the advantages they offer over alternative choices create an extremely compelling case for an upgrade. Read on to discover how Corona Contacts’ array of specialist options can help your business. Security is essential in all professional environments. It’s vital to protect expensive, unique equipment and personal information stored in the workplace. Motorised curtain track systems offer a considerable upgrade in workplace security by presenting the illusion of occupancy every day, even during weekends and public holidays. This is achieved through automated systems which control curtain opening and closing at set times each day, several times a day if required. The security benefit is particularly useful for businesses whose premises are not consistently occupied or operate outside of regular office hours. Motorised systems even offer remote control via an internet connection; a business owner could be may hundreds of miles away and still be able to operate their fixtures remotely. Automated operation can also be triggered by lighting conditions. If an area has an issue such as excessive heat from the sun or glare, the curtain tracks can be triggered to operate when the threshold level is reached. Customers working in a presentation or public-facing environment are particularly appreciative of this as it offers an extremely convenient solution with minimal distraction to clients. Over time businesses also benefit from a productivity boost since employees are no longer occupied by the need to leave their workstation and manually operate the curtain fixtures depending on temperature and lighting conditions. Hard to reach areas tend to reap major benefits from motorised curtain track systems. Often in larger installations such as theatres curtains hang from extremely high suspension points. Issues of access arise often in environments such as these and the weight of large, thick curtains can also pose challenges to manual operation. Automated and remote control motorised curtain track systems solve many of these issues. What’s more, with no need for a manual drawstring any possible health and safety issues arising from ligature hazards are nullified, something our clients in the education world are particularly appreciative of. These are just a few of the advantages that motorised curtain track systems can provide for your business. If you’d like to chat to us about your specific requirements and find out how our systems can be customised to your needs, don’t hesitate to reach out to Corona Contracts today. In many cases we can provide an estimate remotely, and we’re happy to discuss how we can help at no obligation. Do you complete projects for private individuals/homes? Our expertise is in large commercial projects. However, if you feel you have a private project which may be suitable please get in touch to discuss. Can you provide samples of fabrics? Absolutely, please contact us advising of a delivery address and the fabrics you are interested in. Alternatively, please contact us for professional advice on materials suitable for your project. What is the largest size you make? Our modular systems can be used to cater to all kinds of large or unusually shaped projects. The limitations are dependant on the system, for example for curtain tracks the weight of the curtain may be what restricts the length. This is why we offer a bespoke design service to ensure that we create and fit the system that best meets your needs. Can motorised curtains and blinds be remote controlled? Yes. There are many advantages to remotely and automatically controlling the natural light of a room, and with Mottura M2Net you can do just this. Do you always create a contract before you start a project? We create a contract once the quote has been agreed upon. After the contract has been agreed we aim to begin work immediately. We accept payment via bank transfer only. Do you require full payment before beginning a project? In most cases we are able to begin work once our quote has been agreed and our contact has been signed, subject to our standard terms, which are available upon request. Will you visit the site to give us a quote? We would be happy to visit the site to quote for a job. We may be able to advise by telephone if you are able to provide sufficient detail about your requirements. We have completed many successful projects in Lancashire, Cumbria, Cheshire, Merseyside, Greater Manchester, Preston, Liverpool, the North West and throughout the UK. What fabrics can you use for curtains and blinds? How quickly are you able to complete an order? Is an expedited service available? We provide a timescale with our quote. We aim to complete all installations as quickly and efficiently as possible, but please remember that in order to provide the highest possible standard of installation and reliability some projects can take several days to complete. Are you able to install outside of regular office hours? We have extensive experience of working within commercial spaces and as such often work outside of traditional hours. Please advise us of access times when enquiring about your quote. As much information as possible will help us (and you) to avoid any surprises! Your location, the size of the area to fitted, the access available to the area, the times the area can be accessed, the desired result e.g. sound insulation, blackout, your preferred material and finish, your budget, your deadline for completion. Please call us for a chat if you are unsure or would like advice. What warranty/after sales support do you offer? All of our products come with their own individual guarantees. Our installations are of the highest quality and do not generally require maintenance. If you feel your installation requires servicing we would be happy to help, so please contact us. My installation has become damaged, can it be repaired? Please contact us to discuss, if repair is impossible we may be able to fit replacement parts. Can you provide custom colours/finishes/fabrics? We are happy to cater to any non-standard requests, please give us a call to discuss. We can provide a printing service to apply your company’s logo or other desired pattern to a fabric. How much energy does a motorised blind system use? Our motorised systems are extremely energy efficient, generally using as much energy as 1 or 2 energy saver bulbs. Exact energy requirements depend on the size of the installation. How long will my motorised installation last? Under normal operating conditions our installations should last the lifetime of the installation space subject to onsite conditions and user operating style.